Despite it only being August, Christmas is only four months away, and for Santa Claus Christmas is every day. In respect of that, there’s no reason why we can’t play and enjoy a wonderful and festive online slot game based around the exploits of Santa and his hard-working troop of elves. Spin through 5 reel slots of yuletide fun and match symbols of reindeers, snowmen and Santa himself to save Christmas and gain the respect of old King Wenceslas. Play now and you’ll start smiling too! visit Easyslots.com. Playson was first established in 2012, making it one of the newer faces to the online gaming scene. This fresh-faced company come with a boundless sense of energy and enthusiasm, their online games are full of technological innovation and thematic creativity. They already have 30 high definition online slot games in their portfolio, and have many more ideas in the pipeline, and have formed businesses partnerships with Leander Games, 1X2 Gaming, Bet Construct and Quickfire, making this relatively new developer a name to look out for. See the range of playson games that are available on the easyslots.com platform. Merry Christmas is a festive fun filled online slot game that celebrates yuletide spirit. This winter wonderland is full of symbols to get you into the holiday spirit as you play with Santa Clause, Rudolf the red-nosed reindeer and Frosty the Snowman. Come and join in on some festive cheer with this 5 reel, 21 payline slot game. You can start spinning from 21p up to £105 per game, with an impressive pay out of 5, 000 times your line stake on offer, this Christmas themed game will surely be a hit. Set in a wintery forest where every pine tree is turned white with snow, are your Christmas garland reels. The reels are filled with brightly coloured festive symbols, the card playing symbols are shaped like glittering tree baubles, they are the most common and represent the lower value symbols. You also have reindeer, snowmen, sleighs, Christmas stockings and Santa as your other festive spirited symbols. Santa and Santa’s Sleigh are the biggest paying symbols, they offer 2, 000x your line bet when you match 5 in a line. The Party Wild symbol not only substitutes for all symbols bar the Scatter, if you find 5 in a line you will boost your line bet by 5, 000x! 3 or more Christmas Stocking symbols will expand to fill an entire reel. If you land 3 or more Clock Scatter symbols anywhere on the reels you will trigger 10 Free Spins! If you find the Christmas Tree Bonus symbol on reels 1 and 5 you will trigger a bonus round. You’ll be presented with a selection on a Christmas tree to pick. You’ll be rewarded with a series of multipliers until you pick an empty bag and end the round. Want a free slots with free spins? Play it here! Finally, there is a Gamble feature which you can play after any winning spin. You’ll be presented with two boxes, one has gold coins the other has nothing. Pick the right box to receive your cheery present, but pick the empty box and you will lose the Gamble. Check out our full range of online slot games, visit the site now. 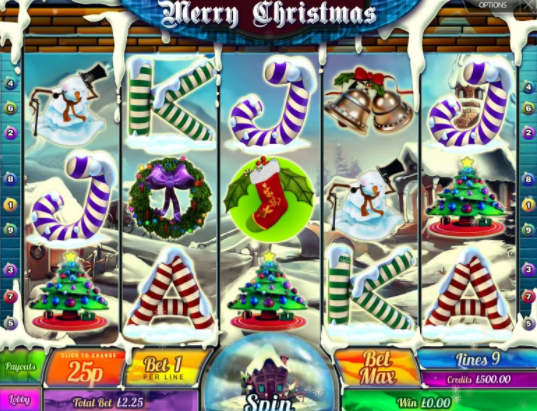 Even if you’re a bit of a Scrooge, you’ll fall in love with this Christmas themed online slot game from Playson. This bright and cheerful game will awaken the Christmas spirit in any player as the betting range will appear to both high rollers and low limit players as it emulates the inclusiveness that is the holiday spirit. You’ve got lots of Free Spins and Bonus rounds to keep you entertained, guaranteeing that Merry Christmas online slot is an unforgettable party. If you had fun playing Merry Christmas, then why not try to discover more?